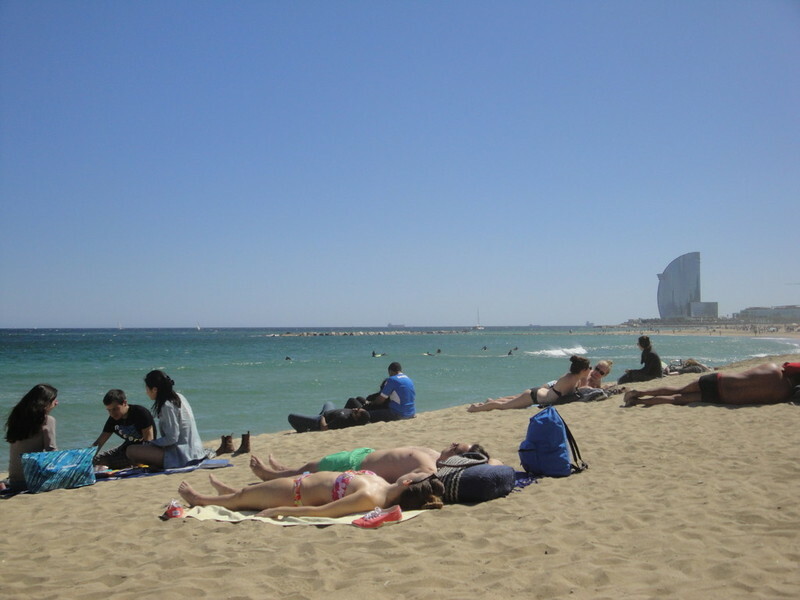 Beauty and the Snob says: Destination: Barcelona, is the capital of Catalonia and the second largest city in Spain after Madrid. It is pure sunshine there with 2,524 hours of sunshine per year! 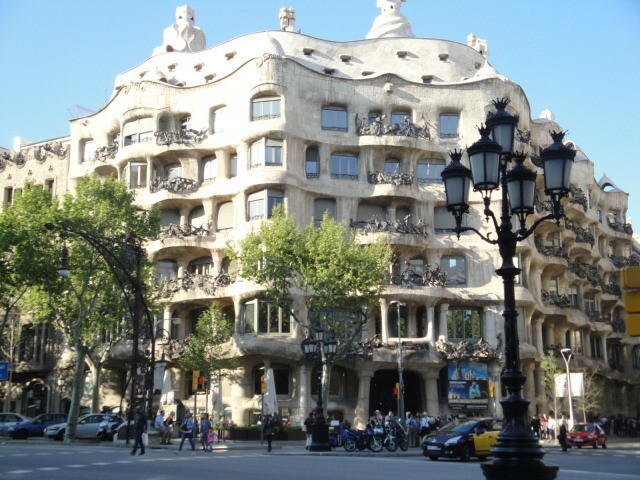 World famous artist Pablo Picasso once lived there as well as the legendary avant-garde architect Antoni Gaudi. The heart of the city belongs to their Rambla Street- which 150000 people walk through each and every day. 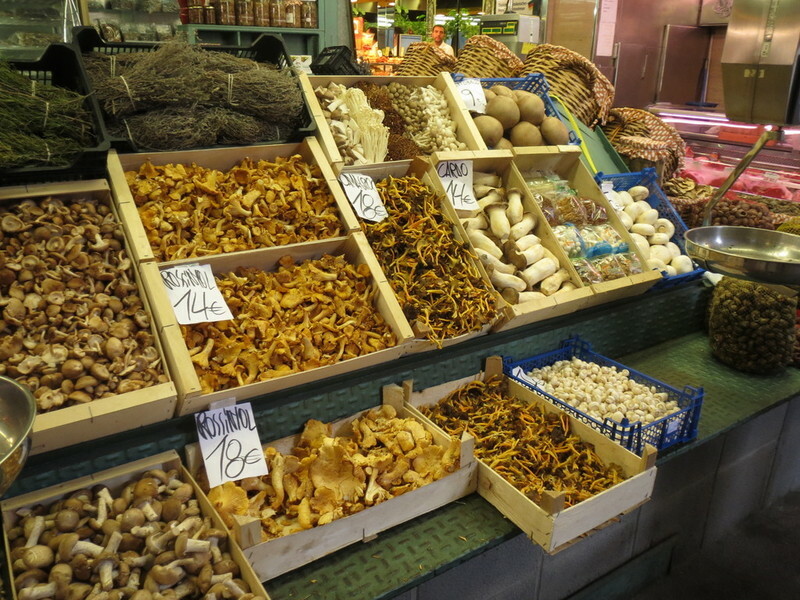 Well, we’ve saved some of the best gems (and I mean places that make you feel like a million at just a smidge of the price) for you in our travel city feature….of the best in food, shopping, and sites…come with us to Barcelona…. From Iberico Paletta cafes that serve up the tastiest ham tapas, to full dinners to tempting deserts, here are some of the most scrumptious venues in Barcelona and at the best price that will please your purse as well…. If you’re looking for the perfect spot to have a romantic dinner for two, then look no further than LA TERTÚLIA just behind the Av. Diagonal on C/Morales. The restaurant, on the outset, has an authentic bohemian atmosphere, and as the sun sets, the terrace is lit by candle light underneath the charm of the soft breeze and surrounding trees of the garden. The food has flair and sophistication without being pretentious. You can see thought being given to the palette as even the most simple croquettes are served with a side of alpha alpha sprouts to give the taste a nutty balance. The paella cannot be compared to any other establishment just off of the Ramblas, as the rice is cooked to an al dente perfection and each bite explodes in your mouth and creates a ‘fruits de mer’ symphony. I highly recommend the Iberian pork brioche as it is tender and melts in the mouth beautifully. For those who like to have something more adventurous, and like to share, I also suggest the steak tartare. It is made with four different liquors: La Ina Fino Jerez-Xérès Sherry, Père Magloire Cognac, Knockando Single Malt 12 yrs old Scotch Whisky, and Mascaró V.O. Brandy & split into four portions. Each portions taste intensifies- giving the whole experience much depth, and at 24.95€ it is an appetiser that should be shared or eaten as a main plate for one. 5 star attentive & friendly service that accomodates all. LA TERTÚLIA is guaranteed to make everlasting fond memories of your holiday in Barcelona. Who says the chicken couldn't cross over the road? Let alone, the french rotisserie chicken who crossed over to Barcelona? For an all over crowd pleaser it has to be Chez Coco. The decor of the restaurant is luxurious french decadence, and it has an amazing terrace with the most comfortable lounge chairs. The rotisserie poussin chckens are roasted- meat falling off the bones, while still being juicy. Choose from a variety of flavours including herb, classic, barbeque and more. The poussins are sufficient for a meal for two although I have no doubt bigger appetities could devour one. The mash potatoe sides are so fluffy and creamy it could only be described as more of a savory souflee. With its fresh and tasteful decor this restaurant is upmarket without being pretentious. Located on the Avenue Diagonal- it is set in the heart of the city near the El Cortes department stores. Menu is written in English, French and Russian. Some of the dishes come in tapas or appetizer format to try like these delicious almond tempura langoustines. 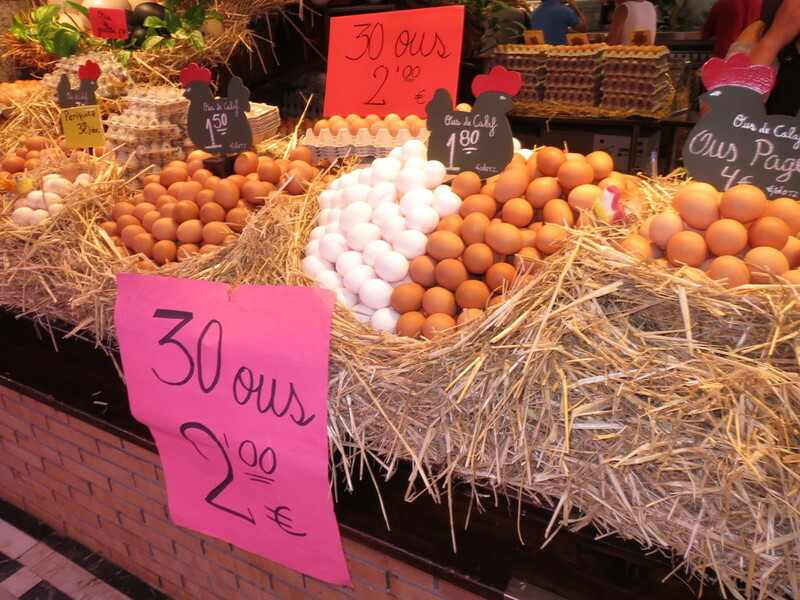 (At around 5.50 euros as starter, or around 15 euros as a main dish.) I recommend their Tuna Tataki which is so fresh and just slightly seared it will make your mouth water! Dinner for two, plus drinks, and desert come up to less than 50 euros. Best yet, to keep the boys quiet they’ve got a huge wide screen tv that plays football and all the games while girls can read their VOGUE & Harper’s….el espanol of course….We give it our 5 STARS for décor, the fantastic taste and presentation of food, fabulous service, and price. 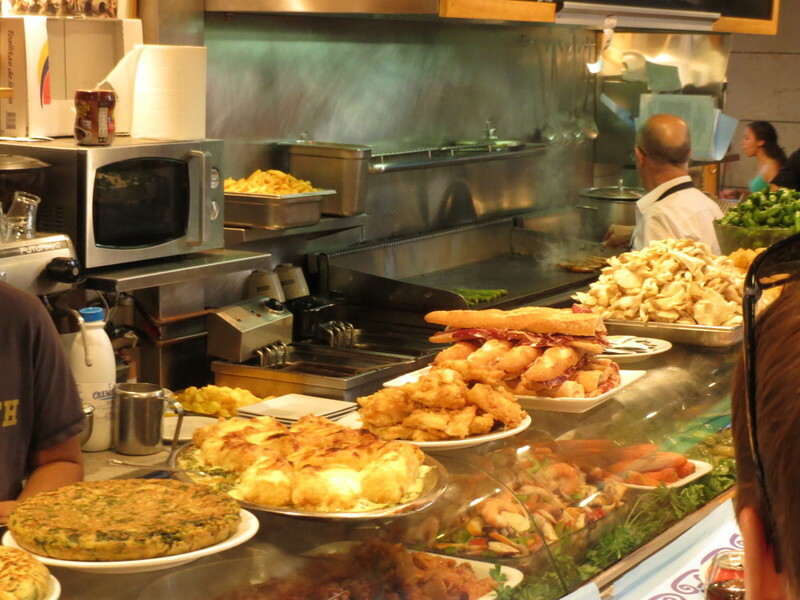 Just off the the Placa de Gracia is Farga Restaurant. The best description of Farga is that it is like any of the upmarket brassieres in Mayfair in London-think Knightsbridge. At the doors is an extensive showcase of bijoux fantasie cakes, biscuits, & confectionaries as well as a la carte dishes. There is a choice of sitting in either the tearoom for light lunch or tea, or the restaurant for main meals. 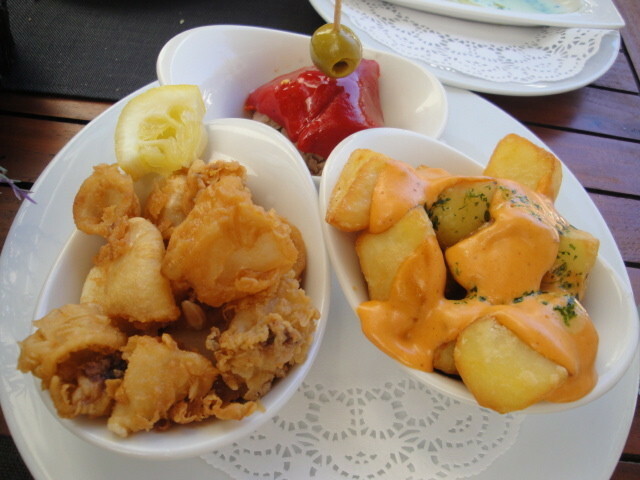 Their lunch special is exceptional value as you get to choose two dishes of your choice for 16 euros. Main dishes in the evening are from 16 or 17 euros but well worth their weight as their seafood and meat is the freshest, and cooked to perfection. The veal steak is simply delicious, and the portion is generous. FYI, there is no use to resist the sweeties on the way out…just say: SI! (YES!) 5 STARS! Exceptional and a must go to! 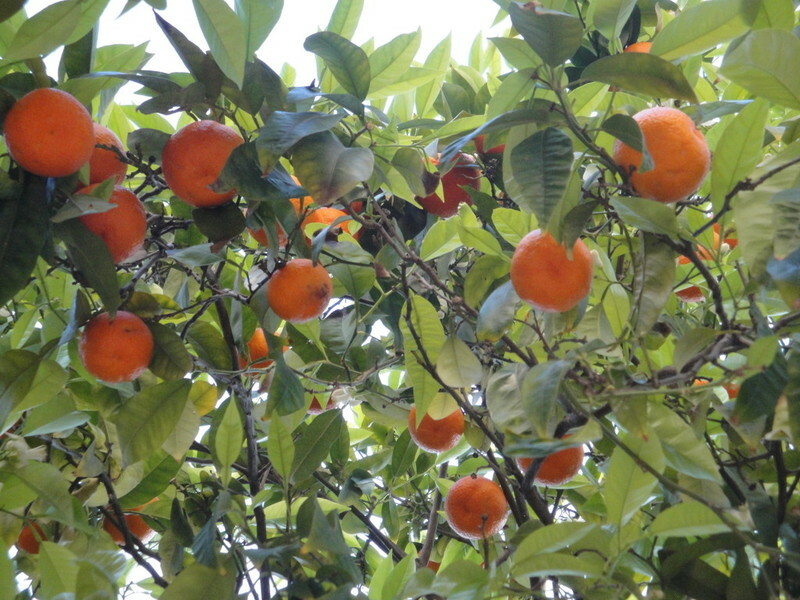 Tucked away on a little side street rather near the Cathedral is La Dolca Herminia. You may not expect such a sophisticated venue to be so reasonable in price, but also that the food is cooked with a pan-asian fusion flair. I recommend their fish dishes, or their 3 course specials for under 25 euros. Service is efficient, not pretentious, and exceptionally friendly/accommodating. 4 STARS or any night in Barcelona after city sights. 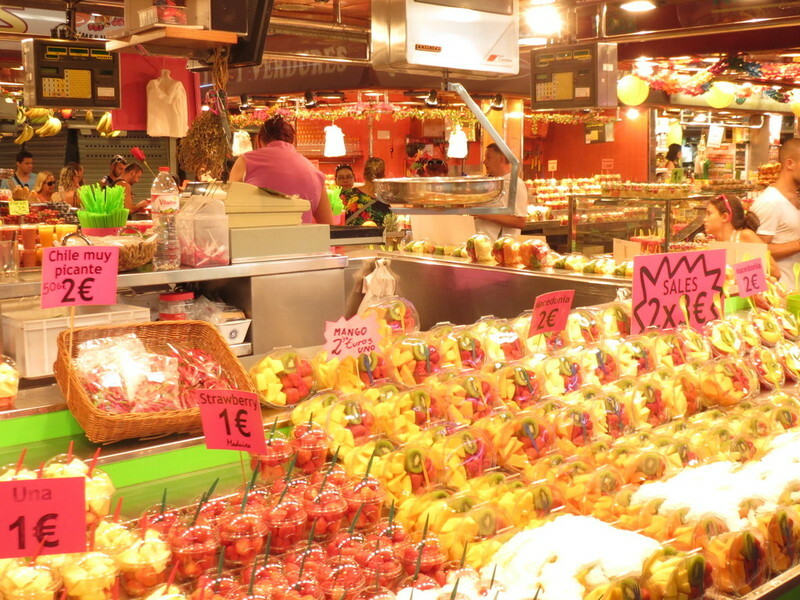 Just off of the La Rambla, is the Mercat de La Boqueria, one of the best markets in the world. 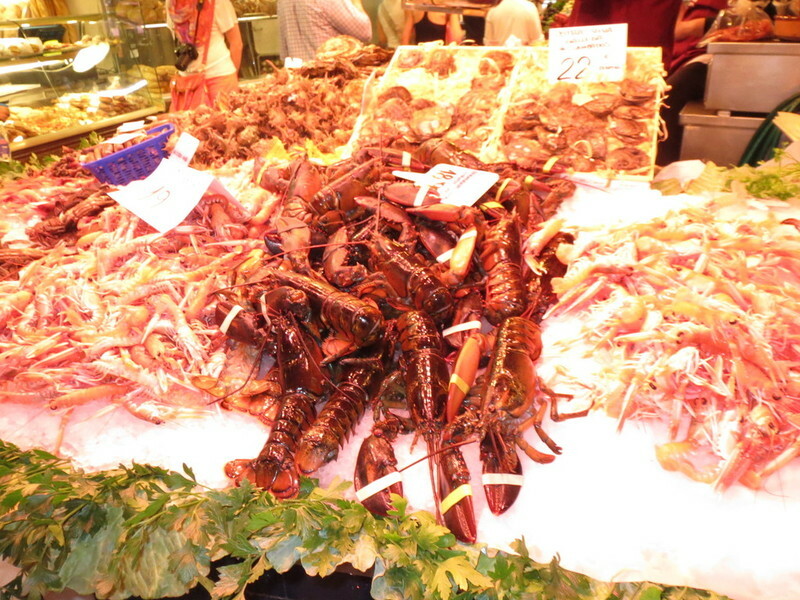 la Boqueria offers a wide selection of fresh fruit, vegetables, meats, seafood and ready to eat treats you can take with you to the beach. It is worth going there first thing in the morning for a nibble before heading out to the beach. 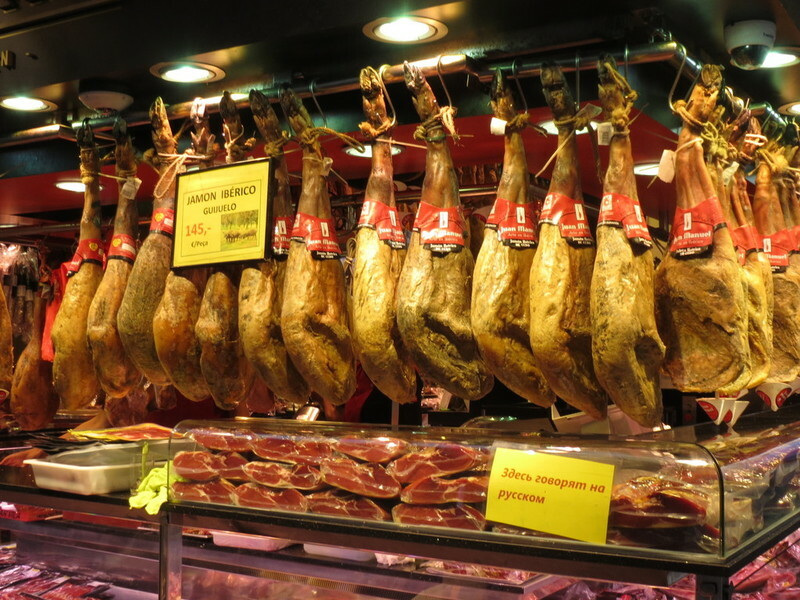 My favourite stalls have to be the ones with the seafood, ice lollies & gelato....no hold on....I also love the fresh fruit...the hams.....am I making you hungry yet?? If you’re tired of eating tapas, and want something different, or want to take a small picnic to the beach then ZEN Sushi might be the answer. A few steps away Avenue Diagonal, at the back of daps restaurant is this little nugget take-away. Sushi boxes of 6-8 pieces start at 3 euros, and are made fresh daily. Choose from a wide range of classical favourites such as salmon rolls, spicy tuna, tempura prawns…and much more. It is authentic Japanese, made with the fresh seafood of Barcelona. 5 STARS for a bite on the run! Beauty often refers to screaming for eyes cream, but this is not for your eyes alas, but for your tummy! This ice cream shop is a station of candy toppings, biscuit toppings, syrups and sauces to build your own: Ice Cream Monster! The ice cream flavour of your choice is first shaved into your bowl while you choose your two toppings/sauces. It is finished off with 2 EYES and voila…..your creation is set to go! A real scream for kids and adults a-like…enjoy it on the beach as it is just a few metres away from the door! At 3.90 euros…it is reasonable and fun! A must….and just for kicks! 'The Fashion Bible'-VOGUE, in Spain loves loves loves this treasure trove for it's electic jewels and gems. Here, you will find some unusual jewellery by some of the best artists worldwide. Pieces start at just in the 20-30s Euros, from Les Nerides (Paris) to more precious pieces in gold, stones and gems. Formista is a small gallery and design shop. It offers and features varied artisan arts & crafts from leathers, to jewelry, to pottery, to hand printed scarves amongst other one off creations. The gallery features artists from all over the world and not only Spanish artists within Barcelona or other Spanish cities. There is something incredible about this store and the story of each object is made-making it the ultimate destination for something extraordinary to take home to remember your journey instead of junk made in China found on the Ramblas. Adults will turn into children in this one of a kind candy shop. 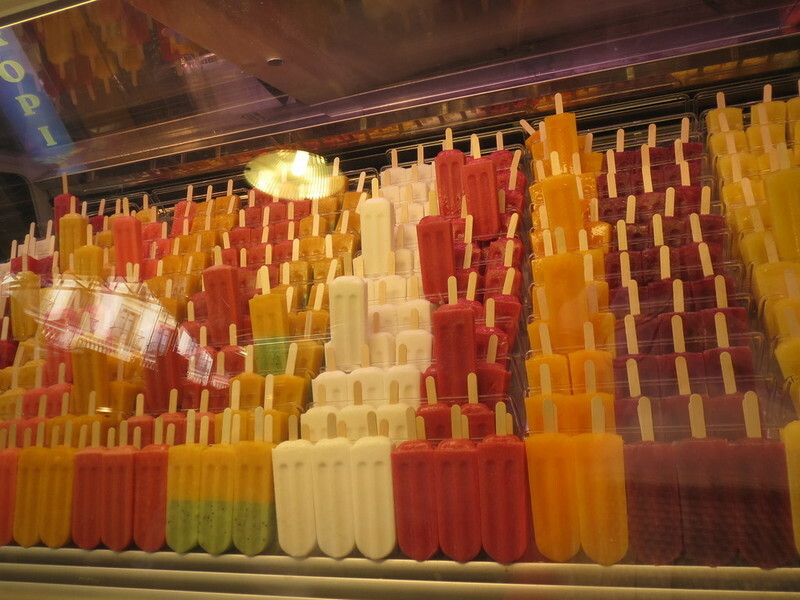 Started in 2004, within the heart of Barcelona, each piece of candy is made by hand. The secret to their success is the intricate details given to the flavours and the aesthetics given to each creation. My favourite is the cola & fruit flavours-flavours that give sunshine to the palette. There are lollipops, ring sweets, chopped and caramel sticks. The candies are shaped and created by melting the caramel with blow torches…..rather like creating edible stain glass….candies for the eyes and the mouth! Truly SWEET! A Barcelona original! Featuring Loewe’s 166 years of artisanal expertise in leather and luxury, the Galería Loewe is magnificent in its form as a museum/exhibition space and flagship store. The shop or space itself is an Antoni Gaudi creation, thus, on the ground floor displays the Amazona bag-paying tribute to the ingenious Spanish architect for his visionary system and calculation for curved structures. There are installations throughout the shop from a hologram that shows how the iconic Amazona is made by a craftsman to the tools that were used then and today. There are displays of historical Loewe pieces once owned by royalty and nobles of Spain, and on the top floor an exclusive space that is dedicated to temporary exhibitions and cultural events related to the brand. In the basement you will find the silks, and see an installation to how their silks dance much like real flamenco dancers. Never has there been a luxury flagship store more cultural and historical. It is the only of the Loewe stores that features the specialty item: the origami tote-a collapsible soft leather tote. This is the only stop to discover the true meaning of what is behind this famous name. Love the thrill of outlet luxury shopping? Well you’re in for a treat! Brought to you by the same lovely group that brings us Bicester Village, just outside of London, La Roca is Barcelona’s Bicester. The village is slightly smaller than Bicester but holds the same coveted fashion brands such as Ralph Lauren, Sandro and Burberry to name a few. Each stores also holds special sales and offers, so be sure to ask before you delve in. 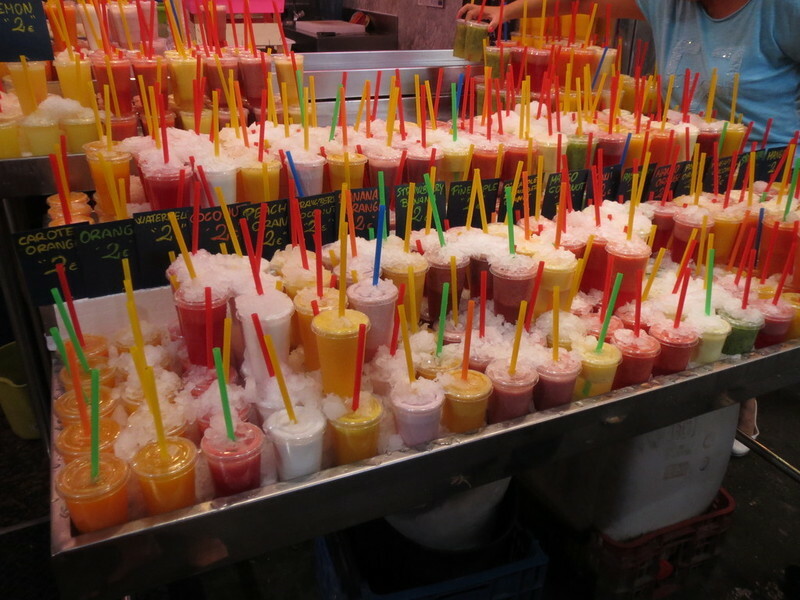 There are plenty of stops for refreshments and food from a choice of four restaurants to ice cream trolleys that sell gelato to Starbucks. Tickets to go are £12 return on coach from the centre of Barcelona city on the hour (same for returns, on the hour).